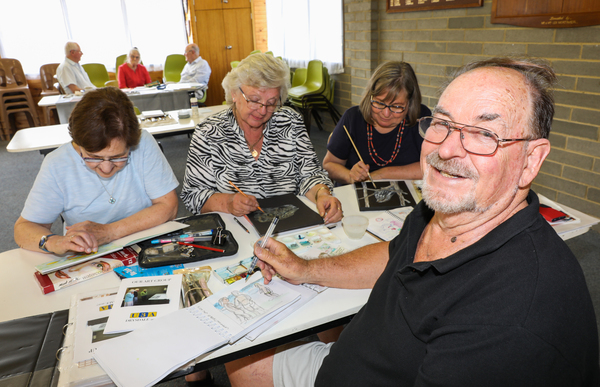 ART and sport rarely mix but keen local artists are serving up a winning combo of brushes, pencils and lamingtons when they gather to paint and draw at Drysdale Tennis Club each week. Newtown’s Ted Reilly has been leading the U3A recreational drawing and painting sessions every Wednesday since early 2015. “I’ve been interested in the visual arts since taking classes when I was 14, but first I went into maths and science at Adelaide University and later read for my PhD in poetics,” Mr Reilly said. While teaching literary studies at Victoria University he drew images from European art to illustrate his lectures, reawakening his practical interest in art. The Drysdale art group was an eclectic mix of people, Mr Reilly said, with 10 enrolled for 2019. Health, grand-parenting responsibilities and travel made numbers fluctuated weekly but at least the clubroom was air-conditioned, he said. “I suppose we are all amateurs, being former teachers, nurses. One is a retired Anglican priest and an architect. “Some of the group have exhibited and I managed to sell two of my oils at the 2018 Drysdale Rotary Art Show. Members use art mediums ranging form oils and watercolours through to Aquarelle pencils, mixed media and pastels, Mr Reilly explained. Members benefitted from developing their own artworks as well as “quietness away from home, chatter, mutual support, tea or coffee, and lamingtons”, he said. Membership information is available at u3ageelong.org.au.